Brady is a mini f1b goldendoodle male puppy. Be is apricot on color and will be approximately 30lbs when full grown. He comes with a 1 year health...View the complete puppy profile for more information. Male Goldendoodle puppy for sale. Just Golden’s and Doodles by the Bay provides early learning experiences necessary to give your puppy a...View the complete puppy profile for more information. goldendoodle puppy aprox 50-70 pounds full grown NON SHEDDING, super friendly, great around kids, pee pad trained. Shots and deworming are UTD....View the complete puppy profile for more information. mini goldendoodle puppy aprox 20-30 pounds full grown NON SHEDDING, super friendly, great around kids, pee pad trained. Shots and deworming...View the complete puppy profile for more information. The current median price of Goldendoodles in Maryland is $1,050.00. This is the price you can expect to pay for the Goldendoodle breed without breeding rights. If you require a pup with breeding rights or for show quality with a top pedigree then expect to pay from $1,800 upwards to $3,000 or even more. The average cost for all Goldendoodles sold in the Maryland area is $1,000. We do not allow Maryland breeders, adoption centers, rescues or shelters to list Goldendoodles for free in Maryland. Beware of scams: If you find a breeder in Maryland or an online advertisement on Craigslist advertising a litter of “puppies for free” or to a “good home for free” then run, do not walk away. 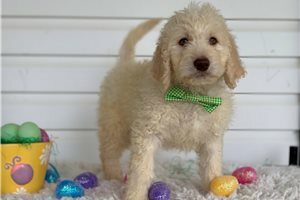 How are Goldendoodles priced near the Maryland area?